It is refreshing to work with a company that really knows what they want in the look, feel, and functionality of their website. It was clear from the start that Fine Art Valuation in Essex had a well defined vision of how their new website should look and behave. We were happy to work closely with FAV to build a fine art WordPress theme with just the right look for this group of young, energetic fine art valuers and collection managers. We wanted the final website to reinforce the company’s branding as well as to support great search optimised content. WordPress is an ideal technology for businesses seeking a beautiful-looking website and the ability to create search optimisation content. We quickly got to work building a custom fine art WordPress theme. We went through a number of design iterations in order to arrive at a fine art WordPress theme that fit with FAV’s vision for their website. It was our goal to develop a website that reflected the business’s chic brand identity while offering a great experience for visitors. To accomplish all of this, we worked intensively with our preferred design partners at Collaborative Thought to develop the right design for our fine art WordPress theme. Fine Art Valuation’s blog is a great example of how a company can use a blog to engage with the business’s customers by publishing interesting, topical, industry-related content. This sort of high quality content can also attract new, unique visitors which may result in new leads and sales. FAV is doing it right by using very high quality images with every new piece of content; in addition to visual impact, their text is always engaging and interesting for readers inside and outside of their industry. It is worth taking the time to create high quality content on your company blog. Fine Art Valuation’s company blog, set inside a gorgeous fine art WordPress theme, is an excellent example of how businesses can leverage their blogs to increase their online profile. An integral part of any search optimised site is a blog full of unique, high quality content. By continuing to add posts to your business’s blog, you keep search engines coming back to your site to trawl for new information. Developing your own content is an important step in keeping your company website at the top of search results for your chosen keywords. Since their website’s launch, FAV has made excellent use of their blog by providing relevant and unique content for their visitors to enjoy. FAV has a very strong sense of its corporate identity and takes great care to preserve and reinforce its brand through its website. Over the last year, Fine Art Valuation has worked hard to preserve the professional look and feel of its fine art WordPress theme. They have done this through consistent use of superb images and text layout. FAV is a stand out for their attention to detail and for their sincere commitment to cultivating their site’s strong first impression for their visitors. 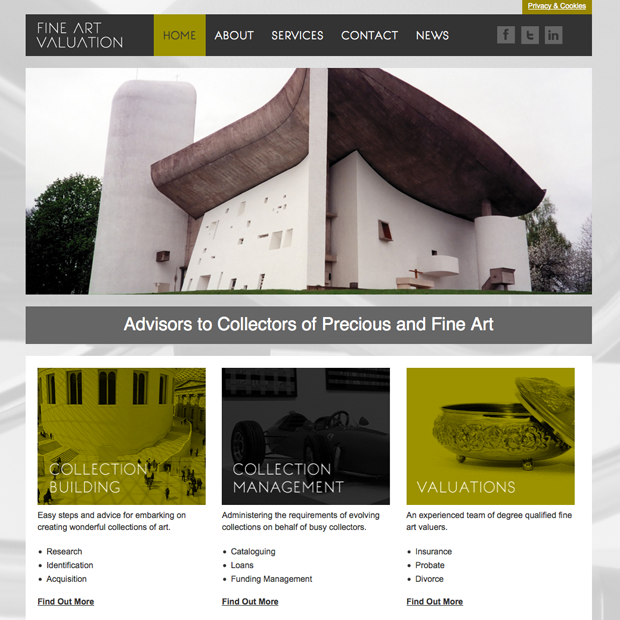 While we’re excited to see how well Fine Art Valuation performs for the ‘fine art valuation’ keywords, it would be nice to see the site compete more strongly in the ‘fine art wealth management’ niche, as ‘collection building’ and ‘collection management’ are two of their 3 core services. Adding content to their blog discussing issues in fine art wealth management to enhance their content strategy could significantly bolster their web presence in these parallel niches. Need a fine art WordPress theme for your website? Interested in working with us to develop a strong content strategy? Get in touch and let’s talk about it!